CBI - China: Day 19 of 154 of the Japanese Invasion of Manchuria. Spain: Day 82 of 985 of the Spanish Civil War. Spain: Day 447 of 985 of the Spanish Civil War. CBI - China: Day 92 of 2,987 of the 2nd Sino-Japanese War. Day 55 of 106 of the 2nd Battle of Shanghai. Day 36 of 70 of the Battle of Taiyuan. Spain: Day 812 of 985 of the Spanish Civil War. CBI - China: Day 457 of 2,987 of the 2nd Sino-Japanese War. Day 118 of 139 of the Battle of Wuhan. Poland: Day 36 of 36 of Germany's Invasion of Poland. Hitler announces the end of his Polish campaign and calls upon Britain and France to make peace with Germany. This is rejected by both British and French governments. While his SS men are butchering Jews and Poles en masse, Hitler extends the olive branch to the Allies, speaking to the Reichstag of his sincere desire for peace, saying that he has no war aims against France or Britain and that up to now he has done nothing more than correct the unjust Versailles Treaty and defend against Polish aggression. 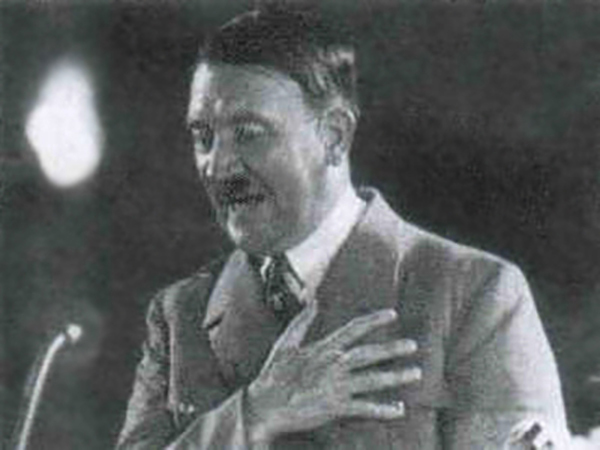 "As Fuehrer of the German people and Chancellor of the Reich, I can thank God at this moment that he has so wonderfully blessed us in our hard struggle for what is our right," said Hitler to the Reichstag, "and beg Him that we and all other nations may find the right way, so that not only the German people but all Europe may once more be granted the blessing of peace." But then he went on to blame warmongers like Churchill for the present state of affairs and calls for a European conference to meet and resolve their few remaining differences. "War in the west," Hitler says, "will be a senseless waste of lives and wealth." But Britain and France see this as the same old familiar tune the dictator has sung after each of his acts of aggression. War has already been declared and they see nothing in Hitler's speech worth believing. Poland: Day 20 of 20 of the USSR's Invasion of Poland. After a twenty-day battle against the Soviets, this fight comes to an end. CBI - China: Day 822 of 2,987 of the 2nd Sino-Japanese War. Day 24 of 26 of the 1st Battle of Changsha. Results in a Chinese victory. ETO - UK: Day 31 of 258 of the Blitz. ETO - UK: Day 89 of 114 of the Battle of Britain. East Africa: Day 119 of 537 of Italy's East African campaign in the lands south of Egypt. CBI - China: Day 1,188 of 2,987 of the 2nd Sino-Japanese War. Day 327 of 381 of the Battle of South Guangxi. CBI - Thailand: Day 6 of 221 of the Franco-Thai War (Vichy France vs Thailand). Russia: Churchill gives a personal undertaking to Stalin to send a convoy every ten days to Russia's northern ports. Russian Front - Finland: Day 100 of 142 of Operation SILVER FOX, a joint German-Finnish campaign to capture the Russian port of Murmansk in the Arctic. Russian Front - Finland: Day 98 of 140 of Operation ARCTIC FOX, a joint German-Finnish campaign against Soviet Northern Front defenses at Salla, Finland. Russian Front - Finland: Day 107 of 164 of the Battle of Hanko. The Soviets will be forced off their leased naval base. Russian Front: Day 107 of 167 of Germany's Operation BARBAROSSA. Russian Front - North: Day 29 of 872 of the Siege of Leningrad. Russian Front - Center: Day 5 of 98 of the Battle of Moscow. Russian Front - South: Day 60 of 70 of the Siege of Odessa, Ukraine. Russian Front - South: Day 11 of 12 of the Battle of the Sea of Azov (north of Black Sea). MTO - Libya: Day 180 of 256 of the Siege of Tobruk. East Africa: Day 484 of 537 of Italy's East African campaign in the lands south of Egypt. CBI - China: Day 1,553 of 2,987 of the 2nd Sino-Japanese War. Day 31 of 33 of the 2nd Battle of Changsha. Russian Front - North: Day 394 of 872 of the Siege of Leningrad. Russian Front - North: Day 155 of 658 of the Siege of the Kholm Pocket, USSR lays siege to the Kholm Pocket but the Germans hold out for a about a year and a half. Russian Front - South: Day 101 of 150 of Germany's CASE BLUE, the failed offensive to take the Caucasus oil fields. Russian Front - South: Day 45 of 165 of the Battle of Stalingrad, bloodiest battle in human history. MTO - Libya: US B-24s attack the harbor at Benghazi. East Africa: Day 155 of 186 of the Battle of Madagascar. CBI - China: Day 1,918 of 2,987 of the 2nd Sino-Japanese War. PTO - Alaska: Day 122 of 435 of the Battle of Kiska, Aleutian Islands. The US and Canada will defeat the Japanese invaders. PTO - Malaya: Day 230 of 357 of the Battle of Timor Island, a long guerrilla war ending in Japanese victory. PTO - New Guinea: Day 78 of 119 of the Battle of the Kokoda Track. The Australians continue pushing back the Japanese troops. PTO - Solomon Islands: Day 61 of 187 of the Battle of Guadalcanal. Russian Front - North: Day 759 of 872 of the Siege of Leningrad. Russian Front - North: Day 520 of 658 of the Siege of the Kholm Pocket. USSR lays siege to the Kholm Pocket but the Germans hold out for a about a year and a half. Russian Front - North: Day 11 of 15 of the USSR Kremenchug Offensive into Estonia. Russian Front - Center: Two Soviet armies take Nevel, Russia, cutting in between German Army Groups North and Centre. Russian Front - South: Day 44 of 122 of the Battle of the Lower Dnieper River, USSR. MTO - Italy: The US 5th Army takes Caserta while British units capture Capua. The RAF and US 12th Air Force provides air support for Allied ground troops. MTO - Greece: US 12th Air Force P-38s strafe Araxos Airfield. CBI - China: Day 2,283 of 2,987 of the 2nd Sino-Japanese War. PTO - New Guinea: Day 18 of 219 of the Battle of Shaggy Ridge. PTO - New Guinea: Day 15 of 162 of the Battle of the Huon Peninsula. Will result in an Allied victory. PTO - Solomon Islands: Day 53 of 56 of the Battle of Vella Lavella and Day 1 of 1 of the Naval Battle of Vella Lavella. US losses are 1 destroyer sunk, 2 destroyers heavily damaged, 64 killed, 47 wounded and 36 missing. The Japanese lose 1 destroyer, with 138 killed. In three days, however, the 56-day battle for the island will end in a US victory. ETO - France: Day 67 of 284 of the Battle of Brittany. ETO - Belgium: Day 35 of 62 of the liberation of Belgium. ETO - Belgium: Day 5 of 38 of the Battle of the Scheldt Estuary. Canadian 3rd Division attack the Germans in the Breskens Pocket in the Netherlands. ETO - France: Day 22 of 236 of the Siege of Dunkirk. ETO - Germany: Day 18 of 145 of the Battle of Hürtgen Forest. ETO - Germany: US 8th Air Force: Over twelve hundred heavy bombers attack targets in northern Germany. Russian Front - Finland: Day 22 of 223 of the Lapland War. Finland and Russia have joined forces to kick the Germans out of Finland's most northern province. Russian Front - North: Day 23 of 41 of the Battle of Riga, Latvia. Russian Front - Center: Day 23 of 72 of the Battle into East Prussia and northern Poland. Russian Front - Center: Day 2 of 18 of the Battle of Memel, a border town of Lithuania and East Prussia. Russian Front - South: Day 1 of 24 of the Battle of Debrecen, Hungary. A Russian offensive by 64 divisions, commences near Arad, Hungary, with the aim of destroying German Army Group South. Russian Front - South: Day 23 of 72 of the Battle of Belgrade, Yugoslavia. MTO - Italy: US 15th Air Force attacks seven German airfields. CBI - Burma: Day 189 of 302 of the Chinese Salween Offensive in Burma. CBI - China: Day 2,649 of 2,987 of the 2nd Sino-Japanese War. Day 173 of 259 of Japan's Operation ICHI-GO. PTO - New Guinea: Day 297 of 597 of the Battle of New Britain. PTO - New Guinea: Day 168 of 481 of the Battle of Western New Guinea. PTO - Palau Islands: Day 22 of 74 of the Battle of Peleliu (Operation STALEMATE II). PTO - Palau Islands: Day 20 of 36 of the Battle of Angaur.